Kubernetes on Azure Stack is in preview. Azure Stack disconnected scenario is not currently supported by the preview. 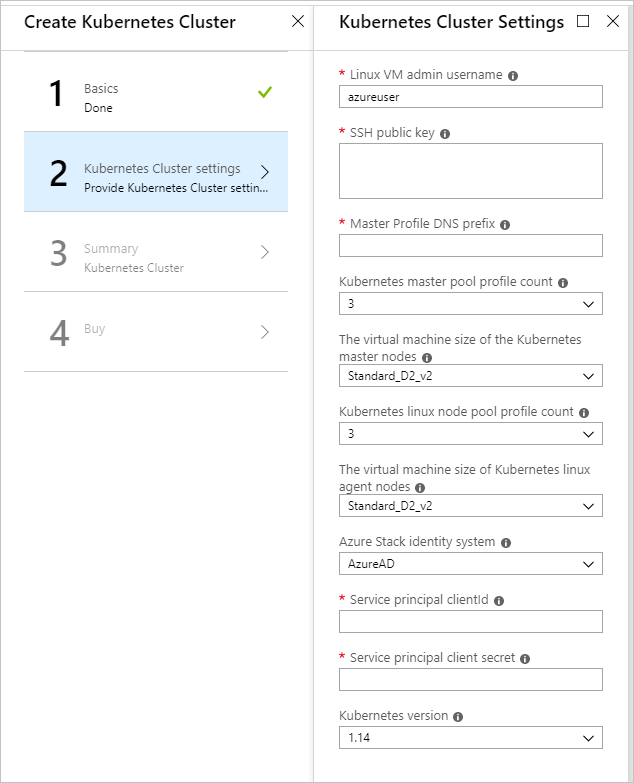 You can follow the steps in this article to deploy and set up the resources for Kubernetes, when using Azure Active Directory (Azure AD) as your identity management service, in a single, coordinated operation. To get started, make sure you have the right permissions and that your Azure Stack is ready. Verify that you can create applications in your Azure Active Directory (Azure AD) tenant. You need these permissions for the Kubernetes deployment. For instructions on checking your permissions, see Check Azure Active Directory permissions. Generate an SSH public and private key pair to sign in to the Linux VM on Azure Stack. You will need the public key when creating the cluster. For instructions on generating a key, see SSH Key Generation. 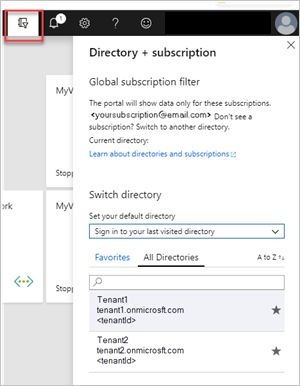 Check that you have a valid subscription in your Azure Stack tenant portal, and that you have enough public IP addresses available to add new applications. The cluster cannot be deployed to an Azure Stack Administrator subscription. You must use a User subscription. If you do not have Kubernetes Cluster in your marketplace, talk to your Azure Stack administrator. Set up a service principal in Azure. The service principal gives your application access to Azure Stack resources. Sign in to the global Azure portal. Check that you signed in using the Azure AD tenant associated with the Azure Stack instance. You can switch your sign-in by clicking the filter icon in the Azure toolbar. Create an Azure AD application. a. Select Azure Active Directory > + App Registrations > New Application Registration. b. Enter a Name of the application. c. Select Web app / API. d. Enter http://localhost for the Sign-on URL. Make note of the Application ID. You will need the ID when creating the cluster. The ID is referenced as Service Principal Client ID. b. Select Never expires for Expires. c. Select Save. Make note the key string. You will need the key string when creating the cluster. The key is referenced as the Service Principal Client Secret. Give the service principal access to your subscription so that the principal can create resources. Sign in to the Azure Stack portal. Select All services > Subscriptions. Select the subscription created by your operator for using the Kubernetes Cluster. Select Access control (IAM) > Select Add role assignment. Select the application name created for your service principal. You may have to type the name in the search box. Open the Azure Stack portal. Select + Create a resource > Compute > Kubernetes Cluster. Click Create. 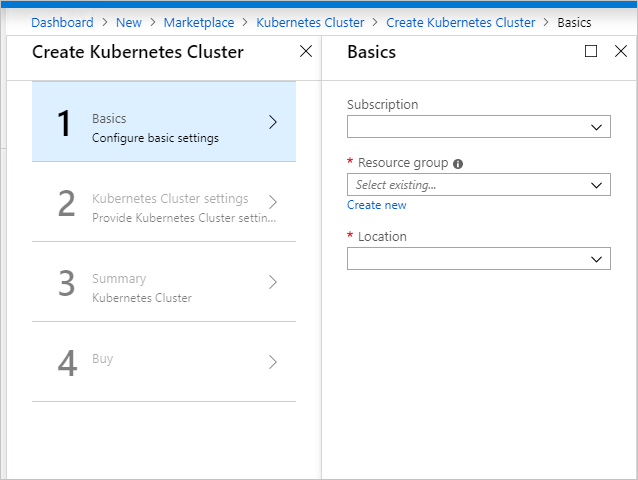 Select Basics in Create Kubernetes Cluster. Enter the name of a new resource group or select an existing resource group. The resource name needs to be alphanumeric and lowercase. Select the Location of the resource group. This is the region you choose for your Azure Stack installation. Select Kubernetes Cluster Settings in Create Kubernetes Cluster. Enter the Linux VM Admin Username. User name for the Linux Virtual Machines that are part of the Kubernetes cluster and DVM. Enter the SSH Public Key used for authorization to all Linux machines created as part of the Kubernetes cluster and DVM. Enter the Master Profile DNS Prefix that is unique to the region. This must be a region-unique name, such as k8s-12345. Try to chose it same as the resource group name as best practice. For each cluster, use a new and unique master profile DNS prefix. Select the Kubernetes Master Pool Profile Count. The count contains the number of nodes in the master pool. There can be from 1 to 7. This value should be an odd number. Select The VMSize of the Kubernetes master VMs. Select the Kubernetes Node Pool Profile Count. The count contains the number of agents in the cluster. Select the Storage Profile. You can choose Blob Disk or Managed Disk. This specifies the VM Size of Kubernetes node VMs. Select Azure AD for the Azure Stack identity system for your Azure Stack installation. Enter the Service Principal ClientId This is used by the Kubernetes Azure cloud provider. The Client ID identified as the Application ID when you created your service principal. Enter the Service Principal Client Secret that you created when creating your service principal. Enter the Kubernetes Azure Cloud Provider Version. This is the version for the Kubernetes Azure provider. 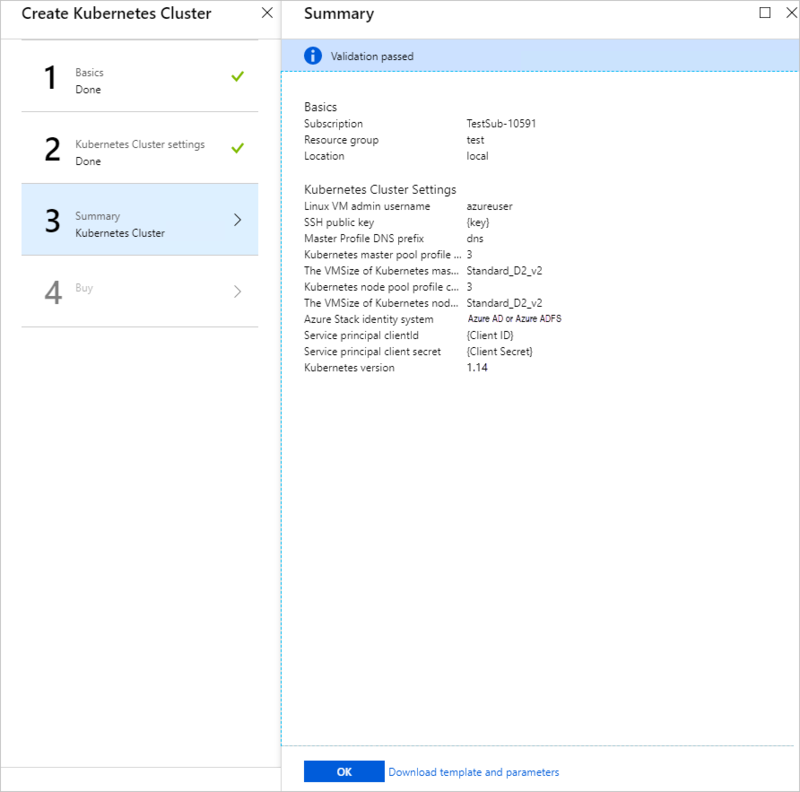 Azure Stack releases a custom Kubernetes build for each Azure Stack version. Select Summary. The blade displays a validation message for your Kubernetes Cluster configurations settings. Select OK to deploy your cluster. If you have questions about your deployment, you can post your question or see if someone has already answered the question in the Azure Stack Forum.